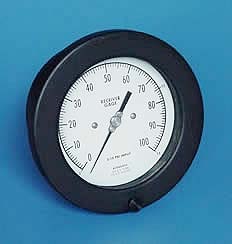 Acragage® Pressure Receiver Gauge Series 1700 - Gauges and Diaphragms | Texas Valves & Instruments, LLC. The process quality receiver gauge is engineered for the demanding requirements of process industries. The gauge is extremely rugged with a bushed stainless steel movement and full blowout back. It is pin-point accurate (±5% of span) and can be re-zeroed at the pointer. Case Size: Phenolic, 4.5" ; Aluminum, 4.5" or 6"
Socket: Brass, carbon steel, or 316 SS. Contact us for a Series 1700 Gauge Today!